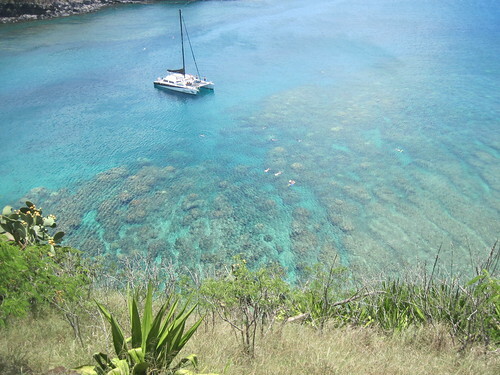 Honolua Bay snorkeling, a photo by Southworth Sailor on Flickr. Getting an early start, we drove to Lahaina. The historic town is filled with shopping, galleries and restaurants. After a couple of hours, we headed north to drive the West Maui north shore. We stumbled on Honolua Bay and decided to get out the snorkeling gear. After a picnic lunch on the rocky beach, we put on the gear and headed for the snorkeling boats, since they probably know where the good spots are. We were a little disappointed in the amount of fish. (Maybe were were spoiled from our Florida experience) It was still enjoyable and a nice break from walking and driving. We continued on the highway as it became more remote and changed into a one lane road with no guard rails and some steep cliffs. The highlight was the village of Kahakuloa. The remote village seemed pretty much the same as it might have been fifty years ago. Once back at the condo, we took a walk on the beach before getting supper.